I seem to be on a bit of a coffee kick lately. Not sure why...maybe it's because I am sitting here in my cozy home, while my local area is being pounded by loads of snow. Yes, I live near Buffalo and just 20 miles away from me, I have friends who are digging out. They are dealing with 5+ feet of snow, caving roofs, driving bans and little supplies at the grocery stores. Thankfully, the massive band of snow missed us and we just have a dusting of snow. My thoughts go out to those who are struggling though. Anyway, after shoveling snow or romping with the children out in the snow, it is nice to come into the house and have a nice hot cup of "something" to drink. Whether it is cocoa, tea or coffee, hot beverages are very comforting on cold, blustery and wintry days. I was soooo excited when I found out that NESCAFÉ teamed up with Coffee-mate to bring us some new and exciting tastes. NESCAFÉ is one of my favorite companies when it comes to hot beverages and my coffee creamer of choice is the Coffee-mate French Vanilla. So, it was such a perfect combination. For this review, I was sent the NESCAFÉ with Coffee-mate in the Hazelnut flavor. I wasn't sure what to expect when it came to this beverage but I was definitely excited to try it out. Upon opening the canister, I found a fragrant powder that is light brown and white in color. This kind of reminded me of instant coffee but much better quality than that. The idea is that the coffee and creamer is mixed in together and you don't have to add creamer later. I love that. All you do to make a delicious cup of coffee is add 2 Tablespoons of the powdered mix to a cup of hot water. I used my Keurig to make the hot water and within seconds, my cup of coffee was ready! This coffee turned out frothy, creamy and amazingly yummy. I think there was caffeine in it but I didn't care...it was SO good. Because I am nursing, I don't typically drink caffeinated beverages but with this, I will definitely make an exception. So, do I recommend NESCAFÉ with Coffee-mate to you? Absolutely!!! It is amazing. I even shared it with my husband and he didn't hate it, which was good. He doesn't drink coffee at all but I at least got him to try it. :) Be sure to check out NESCAFÉ with Coffee-mate and pick your favorite flavor...Hazelnut, French Vanilla and Original! Also, head on over to NESCAFÉ on Facebook to see what is happening there. Disclaimer: I received no monetary compensation for this post. 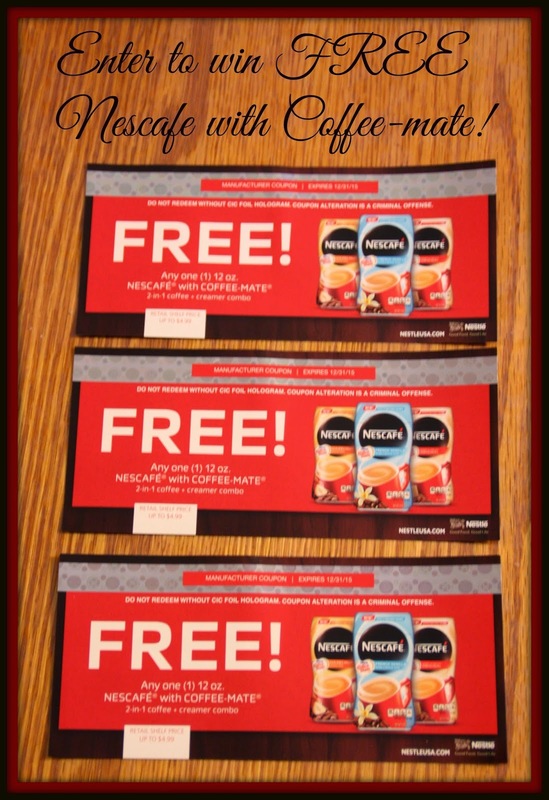 As a member of Smiley360, I received free NESCAFÉ with Coffee-mate and product coupons for review purposes. All quotes and stock photos are from the NESCAFÉ website and email. Prizes are in coupon form and will be mailed by myself. This blog is not responsible for lost, damaged or stolen prizes and in this case, I am not responsible for replacing coupons under any circumstances. All thoughts and opinions are 100% mine. I am all about the French vanilla Flavor. I think I would like to try french vanilla the most out of the choices. Followed by original. I would love the Hazelnut the most! I would most like to try the hazelnut, I'm a big fan of hazelnut. I would most like to try the French Vanilla flavor. I like Hazelnut the best! i have to go with the hazelnut. always the hazelnut. I would most like to try the French Vanilla. It is my favorite flavor. I would most like to try the French Vanilla. I'd like to try the French Vanilla flavor.